Painting tips always help when preparing for your upcoming project. Giving you that extra information to get the job done. This week we’ve collected 10 tips to help you with your interior painting. Different paint finishes have their advantages. Before you paint consider wall imperfections and other factors. High-gloss offers greater durability and is very easy to clean. If your wall is less than perfect, however, high-gloss paint can enhance the imperfections. Flat paint will do a much better job of hiding imperfections, but it’s much easier to damage than high-gloss. Eggshell is a great middle-of-the-road choice. Don’t let the fear of color turn your room white. Colors can add depth and texture to a room. Using the right colors can turn an otherwise dull room into a beautiful, warm space, and well if you get a color you don’t like, just paint over it! Small samples prevent big surprises. It’s difficult to tell what a color is going to look like on your wall using a small paint swatch. Conversely, investing in a “test gallon” can get expensive, especially if you can’t make up your mind. 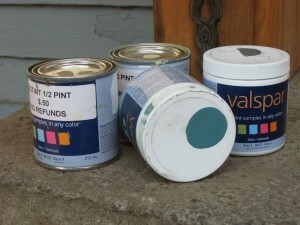 To help with this many paint manufacturers offer small sample cans of their colors. They cost only a few bucks and will prevent you from wasting money on a color that isn’t what you want. Square footage is only half the equation. It’s a well known fact that when you go to buy paint, you have to know the square footage of the room. However, there are many other factors that contribute to the amount of paint you will need. You must always consider the surface you’re painting. If you’re priming the walls, and then what number of coats you are going to need. These things together, square footage, prime, and coats will affect the amount of paint you need to purchase. Make sure to give yourself some time to prep. About 80 percent of your time will be spent doing the prep work for the painting. Painting will not hide all of a walls imperfections, so it’s important that you take proper steps to make your walls as flat as possible. You also want to clean them before you begin paining since dust or debris left on a wall could cause new paint to peel. Primer, is well, primer. Primer is essential in any good-quality painting job. It seals the surface of your walls, provides a great base for paint to grab, and helps keep the coats of pain you need to a minimum. If you had to spackle you walls, using primer is a must to prevent flashing. Don’t cut in a line. Always do brushwork in the corners before you start rolling. Rolling after brushwork will even out the brushstrokes left on the wall. Rollers can put more than paint on the wall. To get rid of those extra fibers on your fluffy roller before you pain use some masking tape to lift that stuff right off. If you don’t those fibers will become a permanent fixture to your wall. Don’t overextend yourself. Extension pulls are a great way to cut time and effort on a painting project. They will prevent you having to climb up and down a ladder and give you more leverage when painting a wall that’s right in front of you. Boxing your paint will ensure you never have to fight blotches. The color mixer can create slight variations from can to can. The last thing you want is to have two shades of a color on the same wall. You can prevent this by mixing all of the paint cans together before you start painting. Boxing your paint ensures you will have consistent color throughout the room.